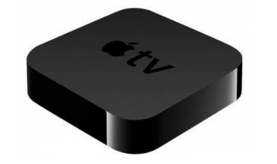 Recently, Apple released an update to the Apple TV bringing that OS to version 6.0. Included in the update was iTunes Radio, the ability to play purchased music, new AirPlay features, and more. Updating the Apple TV is usually pretty easy, but what if something goes wrong? It did for me when I updated an Apple TV 2. The screen was black on the TV and the light on my Apple TV was blinking at a nonstop rapid pace. My first thought was, “I now have a brick instead of an Apple TV.” After that I calmed down tried to fix it. I started by unplugging the Apple TV and plugging it back in. Unfortunately, that didn’t do much except give me directions on how to fix it. The connect to iTunes symbol appeared on the screen (a cable going to the iTunes logo), and that is what I did. I disconnected the unit from the TV, and beneath the HDMI plug is a little micro-USB port. That is how you connect to a computer running iTunes (Mac or Windows). Obviously, you need a micro-USB cable. If you don’t have one they are easily available at office supply stores and electronic stores and everywhere online. With a USB cable in hand, I took the Apple TV to a Mac running iTunes and connected the two. I don’t know if this is required, but I kept the Apple TV plugged in to the electric outlet. The computer saw the Apple TV like it would see an iPod or iPad and it walked me through restoring it in iTunes. After about ten minutes, the AppleTV was restored with the latest OS running on it. iTunes said to disconnect it and hook it up the TV. I did and all was well again. So now you know what to do if your AppleTV update ever goes wrong. Don’t panic, just grab that micro-USB cable and a computer running iTunes. Previous PostPrevious What are the Long-Term Effects of Electronics?